Methods: Biodegradable in situ injectable implants were prepared by polymer precipitation method using polylactide-co-glycolide (PLGA). An optimized formulation was obtained on the basis of drug entrapment efficiency, gelling behavior and in vitro drug release. The compatibility of the formulation ingredients were tested by Fourier transform infrared (FT-IR) spectroscopy, and differential scanning colorimetry (DSC). SEM study was performed to characterize in vivo behavior of in situ implant. Pharmacokinetic study and in vivo gelling study of the optimized formulation were performed on Sprague-Dawley rats. Stability testing of optimized formulation was also performed. Results: The drug entrapment efficiency increased and burst release decreased with an increase in the polymer concentration. Sustained drug release was obtained up to five days. SEM photomicrographs indicated uniform gel formation. Chemical interaction between the components of the formulation was not observed by FT-IR and DSC study. Pharmacokinetic studies of the optimized formulation revealed that the maximum plasma concentration (Cmax), time to achieve Cmax (Tmax) and area under plasma concentration curve (AUC) were significantly higher than the marketed intramuscular injection of lornoxicam. Stability study of optimized batch showed no change in physical and chemical characteristics. Conclusion: Lornoxicam can be successfully formulated as in situ injectable implant that provides long-term management of inflammatory disorders with improved patient compliance. 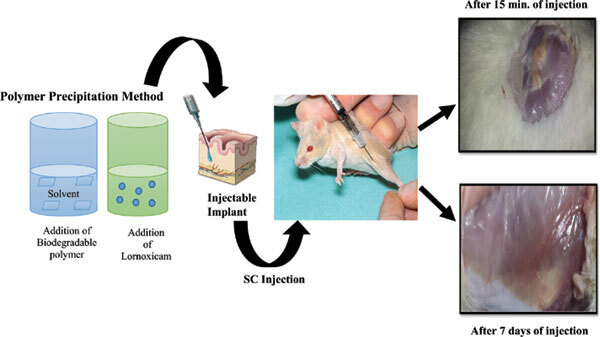 Osteoarthritis, lornoxicam, PLGA, in situ injectable implant, in vivo study, biodegradable.